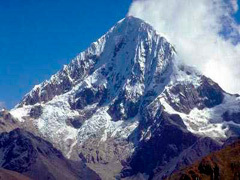 A trekkin thropugh beautiful landscapes, observing the second high snow mountain of the Cuzco region, SALKANTAY. 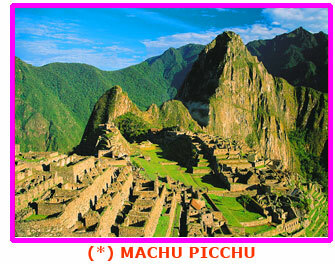 Additionally, a visit to the wonder of themodern world, Machu Picchu above Aguas Calientes town. 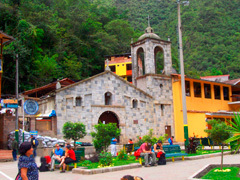 DAY 5 Aguas Calientes-Machu Picchu. From Cusco we will leave very early in the morning at 6.00am. 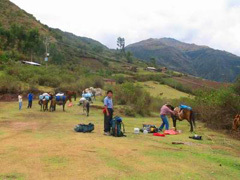 our private bus will pick you up from your hotel then drive to MOLLEPATA (trailhead) the bus ride will take us around 3 hours, when we get Mollepata we have our first breakfast and arrange our horses. 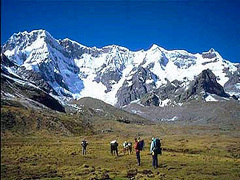 Then we will continue to CRUZ PATA with the bus, and start hiking, horses and mules will come behind us, then in the middle of the way we will have lunch, after the lunch we will have one hour to take a rest and then continue hiking, we start walking to SORAYPAMPA (3.850 masl), after to walk for about 6 hours we will arrive to Soraypampa and we will prepare our camp site in the base of the first Mountain HUMANTAY 5917 masl a snow capped mountain. When we will arrive to the camp site our mountain staff will be waiting for us with some hot tea. And later a delicious dinner and overnight at 4200 of altitude. From here we will have nice views of the mountain and we will see the Inkachiriashka pass in front of us where the trail leads to the classic inka trail, then after to enjoy nice views from the pass we will continue hiking, this time down the small valley for about 1 hours through a nice place of Huayracmachay where we will have lunch, then after lunch we will continue going down but this time we will have notorious climate change as we approach to the jungle area of Cusco, we will start hiking down as we are getting into the forest full of orchids and exotic plants, we will pass over huts of Rayanpata finally we will arrive to Chaullay and we will start preparing our camping next to he humble huts where the owners offer cold bears and soda waters to the trekkers camp at Chaullay 2.900 masl dinner and overnight. 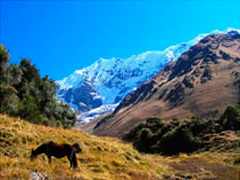 Early in the morning we will have breakfast in challhuay then start hiking down passing through Colpapampa then hike down along the Salkantaymayu as we go down we can observe many kind of exotic plants hills full of trees considered jungle area of Cusco, In this part of the trek we will walk on a narrow trail on the mountainside, crossing some species of orchids and different kinds of plants, and some cornfields, fruit fields and we will have opportunity to see the most beautiful waterfall on the trail. After 5 hours walking. we will get to LA PLAYA, we will observe coffe plants and many fruit plants then we will continue to SAHUAYACO for about some minutes, here we will find basic shops where we will find drinks and other things we will prepare our camp site in the particular fields because here the camping fields have owners who will be familiar with visitors, dinner and overnight in SAHUAYACO around 2200masl . After the breakfast in SAHUAYACO we will aboard the public bus (only that service) then start driving to SANTA TERESA town is over 1.645 msal we will pass by the classical jungle area a lot of coffee plants, we will drive for about 45 minutes to get to SANTA TERESA arriving around 10:00 am, here men, women and young girls will be waiting for us to help us with our equipments to carry until the hanging bridge because there are no cars or mules for this part of the trail this part of the trail will take us about 30 minutes hiking, all this area was destroyed by the landslide and the trails were closed, even the railways was destroyed, then we will arrive to the hanging bridge to cross the Urubamba river and take the public truck of the Machupicchu Town hall and drive to hydroelectric power station which sis also a small village and the train station for this part of the trail. Here we can see many kinds of fruits, tree and plants. 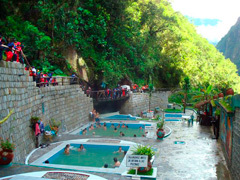 We will have lunch in the Hydroelectric and continue hiking to Aguas calientes but before we can enjoy the highest rocky mountain over us wich is part of Huaynapicchu where are the Machupicchu’s inka ruins, Finally we arrive at the last place of our things ready and around 4:00pm we will take hot shower in our selected hotel in Aguas Calientes restaurant and overnight in Aguas Calientes. After the breakfast in the Hotel in Aguas Calientes we will the morning bus to the Archeological Site of Machupicchu, When we get to Machupicchu we will have guided tours for about 2 hours the guide will inform us about the importance and story of each site in Machupicchu walking around the ruins and visit the most important places of Machupicchu. After the guided visit Machupicchu visitors will have time to walk by themselves taking photographs, another option is for climbing up to the Huaynapicchu Mountain, enjoying the view of all of Machupicchu Inka Citadel. 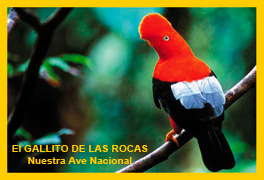 After the whole visit to the ruins we will meet in the main entrance of Machupicchu to come back all together with bus to Aguas Calientes, Passengers will have lunch in recommended restaurant and then in the late afternoon we will coach the train back to Cusco during 4 hours. ARRIVAL to Cusco around 8:20pm. approximately. Transfer to the hotel. End of our service. • Transportación to return to Cusco by train and bus arriving at 9 to 9:30 pm. 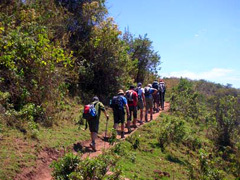 We do groups from different nationalities; consider the weather now it is the rain seasons ask for the list of clothes you need to bring for the trek. This program could change depending the step of the clients…..
• 01 set of clothes. • Photo camera with enough batteries, cards and films..
• Repellent, sunblock and hat. • Optional : Canes covered qith rubbee for the trekkin. Snacks: Cookies, sweet chicolates, energizer bars, etc.